(Crispr-assisted). Var genes silenced, alongside other transcriptomic changes. 'deletion of PfRecQ1 increased the heterochromatin mark trimethylated (H3K9me3) at the transcription start site (TSS) of the var gene upsC1, that deletion had no effect on the global distribution of H3K9me3 over gene bodies, including those for the var genes'. Rescued by complementation. 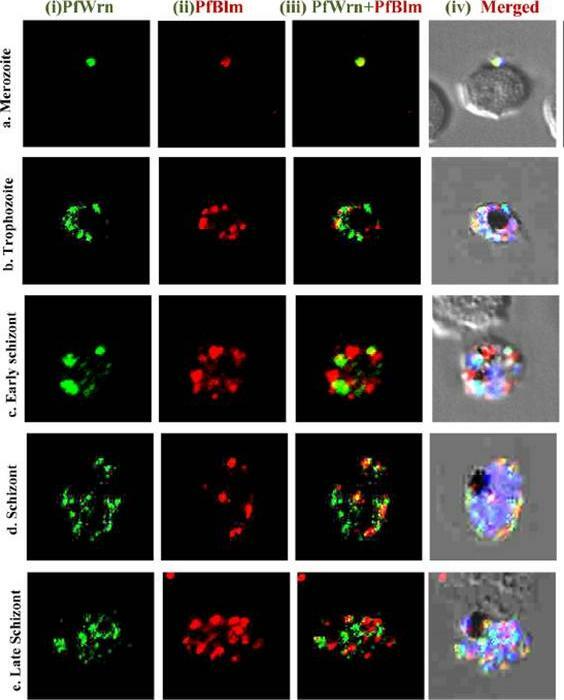 Localization of PfBlmin different intra-erythrocytic stages of P. falciparum by immunofluorescence staining and confocalmicroscopy. The cells were fixed and immunostained with purified primary antibodies against PfBlm followed by fluoroisothiocyanate-labelled secondary antibody and then counterstained with DAPI. In each panel, single confocal image of each stage is shown. 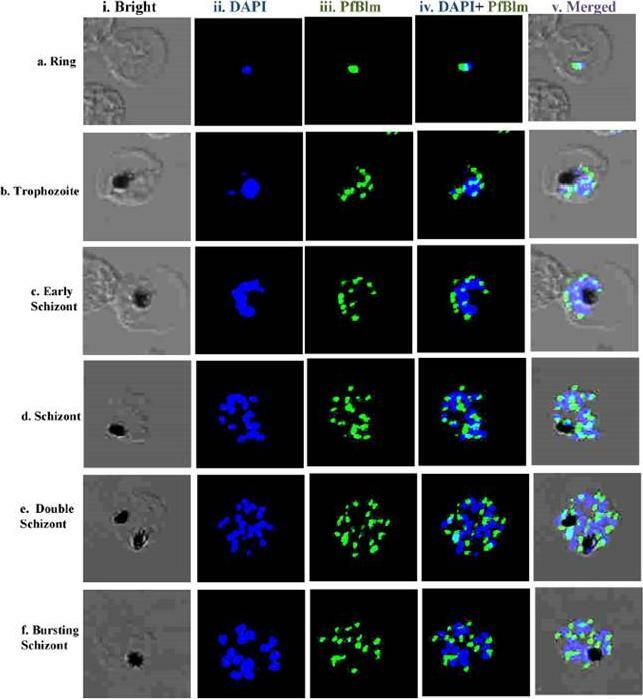 (a) Ring stage, (b) trophozoite stage, (c) early schizont stage, (d) schizont stage, (e) double infection in schizont stage, (f) bursting schizont stage. In each panel (i) phase contrast image; (ii) image of cell stained with DAPI (blue); (iii) immunofluorescently stained cell (green); (iv) super-imposed image; (v) merged. These data are representative of threeseparate experiments. 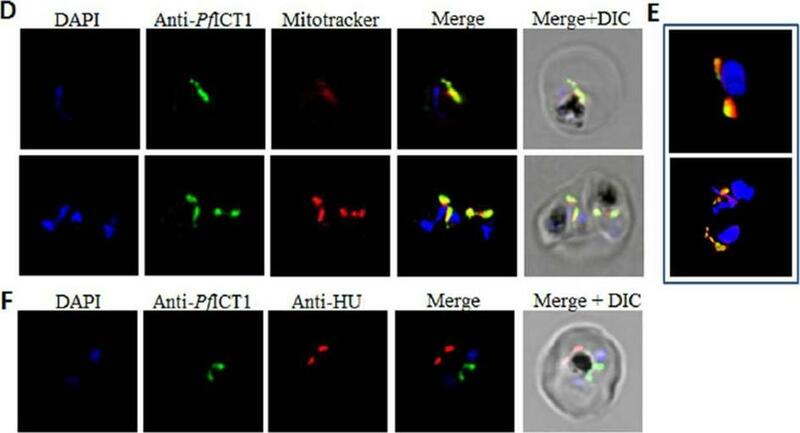 The results showthat Blm protein expresses and localizesmainly in the nuclear region during the ring and trophozoite stages (a–b) but it is also detectable in cytoplasm during the schizont stages of intraerythrocytic development of the parasite.Rahman F, Tarique M, Tuteja R. Plasmodium falciparum Bloom homologue, a nucleocytoplasmic protein, translocates in 3' to 5' direction and is essential for parasite growth. Biochim Biophys Acta. 2016 1864(5):594-608.